152 Insights to My Soul: We really got snow. Like 6 inches. Enough that Cate was able to play in it two consecutive days. She wasn't completely sold on the idea of being cold and slightly wet [really, who could blame her?! ], but she liked talking about the snow. When it was coming down Friday afternoon and evening, she would say, "I check on snow," and then look out the window. ... He's small, but he's still standing. It wasn't the best snowman-packing snow. 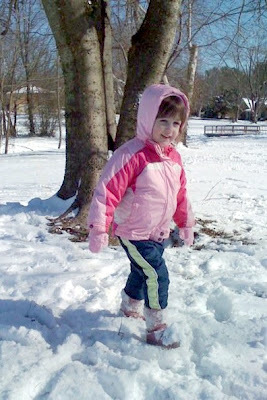 This photo was taken with my iPhone when we played in the snow at the park across the street from our house earlier today. Not bad. I can't remember the last time we had enough snow that playing in it on two consecutive days was possible.